This image was scanned from the publication - How Firm a Foundation: A History of the Township of Cramahe and the Village of Colborne in Cramahe's Digital Archives (3bk), p.8. 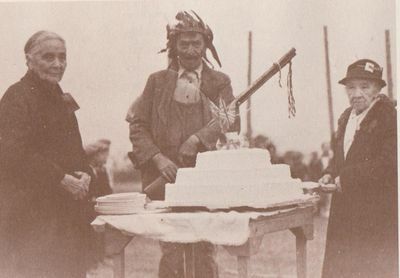 The caption reads: "Mary Ann Black, George Beaver and Ellen Loukes cut the anniversary cake to mark the 100th anniversary of the resettlement of the Mississauga people of the Alderville Reserve, 1937. They were moved there from Grape Island in 1837."